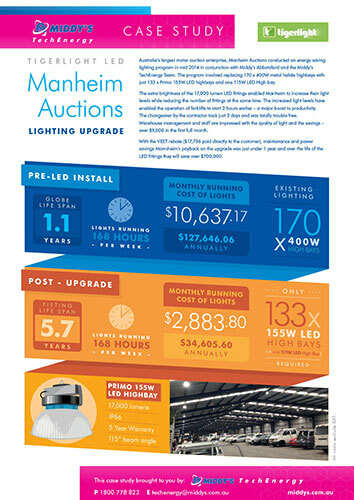 Australia’s largest motor auction enterprise, Manheim Auctions conducted an energy saving lighting program in mid 2014 in conjunction with Middy’s Abbotsford and the Middy’s TechEnergy Team. The program involved replacing 170 x 400W metal halide highbays with just 133 x Primo 155W LED highbays and one 115W LED high bay. The extra brightness of the 17,000 lumen LED fittings enabled Manheim to increase their light levels while reducing the number of fittings at the same time. The increased light levels have enabled the operation of forklifts to start 2 hours earlier – a major boost to productivity. Middy’s are a proud sponsor of Muscular Dystrophy Australia. 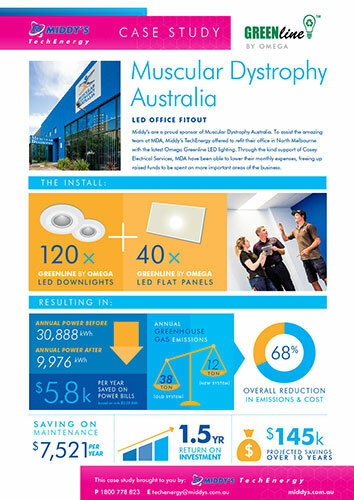 To assist the amazing team at MDA, Middy’s Energy Smart offered to refit their office in North Melbourne with the latest Omega Greenline LED lighting. 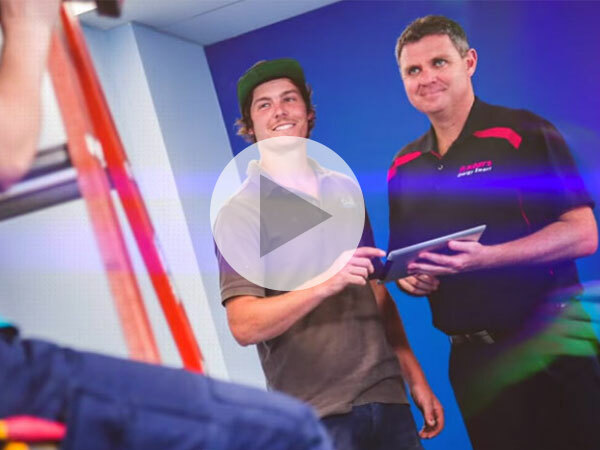 Through the kind support of Casey Electrical Services, MDA have been able to lower their monthly expenses, freeing up raised funds to be spent on more important areas of the business. Most electrical contractors are aware of the many energy efficient products available on the market, but do you know which products provide the greatest benefit to your customers? Middy's Energy Smart has been setup to provide product knowledge and installation information to make you an expert on energy efficient products. The Northern Victoria Livestock Exchange is the largest livestock exchange in Victoria for its throughput of cattle and one of the largest in Australia. NVLX conducts Prime, Store, Cow, Bull and Special Cattle sales as well as sheep and horse sales and has a ten year throughput average in excess of 205,000. 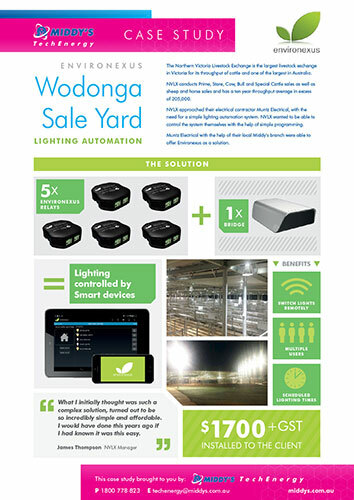 NVLX approached their electrical contractor Muntz Electrical, with the need for a simple lighting automation system. 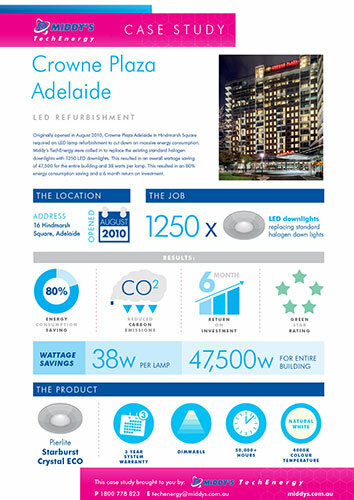 Originally opened in August 2010, Crowne Plaza Adelaide in Hindmarsh Square required an LED lamp refurbishment to cut down on massive energy consumption. Middy’s TechEnergy were called in to replace the existing standard halogen downlights with 1250 LED downlights. This resulted in an overall wattage saving of 47,500 for the entire building and 38 watts per lamp. 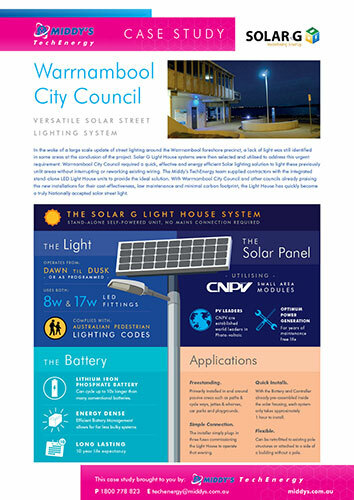 In the wake of a large scale update of street lighting around the Warrnambool foreshore precinct, a lack of light was still identified in some areas at the conclusion of the project. Solar G Light House systems were then selected and utilised to address this urgent requirement. 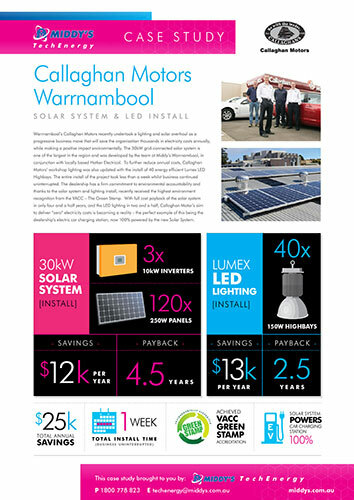 Warrnambool’s Callaghan Motors recently undertook a lighting and solar overhaul as a progressive business move that will save the organisation thousands in electricity costs annually, while making a positive impact environmentally. Welcome to the Future. Welcome to Today. Environexus Smartlock - Lock and unlock your door remotely. Environexus Camera - View your camera from your smartphone. Environexus Sensor - Sensors for motion, temperature and light. 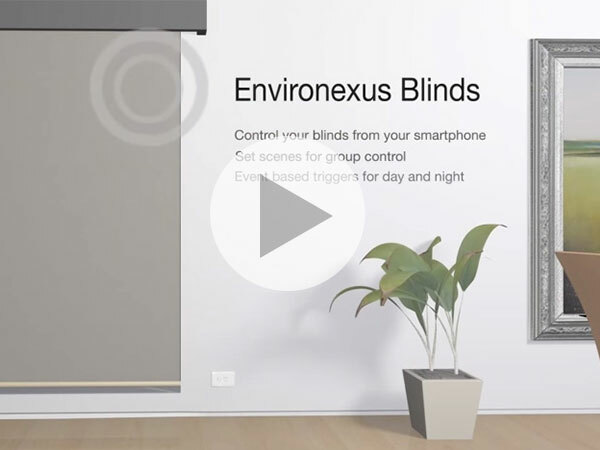 Environexus Blinds - Control your blinds from your smartphone. Environexus Lighting - Discrete reto fit technology. Environexus Energy - Monitor your power consumption. Environexus Bridge - Safe, secure and scalable system design. 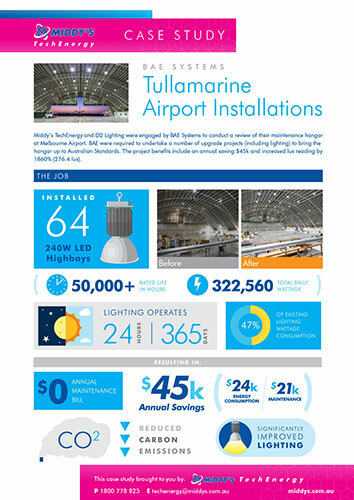 Middy’s TechEnergy and D2 Lighting were engaged by BAE Systems to conduct a review of their maintenance hangar at Melbourne Airport. BAE were required to undertake a number of upgrade projects (including lighting) to bring the hangar up to Australian Standards. The project benefits include an annual saving of $45k and increased lux reading by 1860% (276.4 lux). Our Middy’s TechEnergy team works with you on any size project to ensure you are offering your customers the most advanced products and energy efficient solutions available. 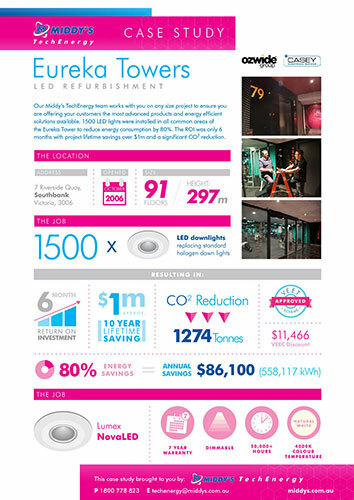 1500 LED lights were installed in all common areas of the Eureka Tower to reduce energy consumption by 80%. The ROI was only 6 months with project lifetime savings over $1m and a significant CO2 reduction.